If you are not allowing inspiration to surround you daily and enrich your life, then what are you doing? 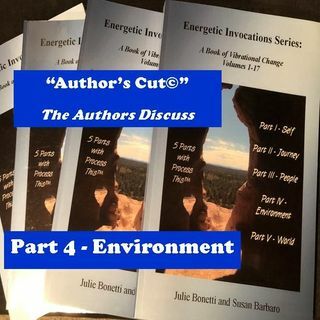 Join the authors’ discussion of Part Four, “Environment,” of “Energetic Invocations: A Book of Vibrational Change,” and work in the energy of space, science, happiness, perception and possibility to enhance your self and your life. Buy the book, entertain yourself with the energy of the discussion, and fill your journey with self-empowerment!